We are one of India's leading travel service providers of Orissa Tribal Tour, specialized in providing customized travel services to tourists visiting the Indian Sub-Continent. AM: Visit to the world famous 'SUN TEMPLE' at Konark. Enroute visit the Buddhist Stupa at Dhauli and the Appliqué center at Pipili. Full day visit to Kanger valley national park to enjoy one of the finest virgin forest tracts on earth, limestone caves known for beautiful stalagmite and stalactite formations. Also visit some of the tribal people in their homes before enjoying your picnic lunch at the popular Tirathgarh falls. Drive back to Jagdalpur after spending time at the falls and lush vegetation. Overnight hotel in Jagdalpur. 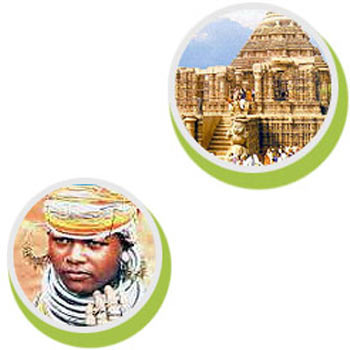 Looking for “Orissa Tribal Tour”?